Mom Knows Best : Amazon Prints is REALLY worth the try!’ $1000 of Amazon Gift Cards to be Won! Summer time means vacation time! It also means time to take lots of photos! I want to capture all those fun summer vacation memories! 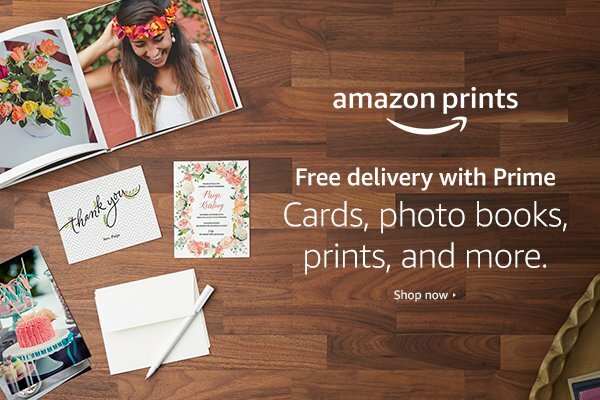 Amazon has launched a photo printing service that allows all customers to print all those vacation photos and more. I sure do love Amazon! Prime members can upload images to their Prime Photos account, print the product of their choice, and receive free delivery. Yea for free delivery! If you’re not a Prime member, you’ll receive 5 GB of storage free on Prime Photos and be able to print your favorite photos. Prints start as low as $0.09. I love being an Amazon Prime member and the free shipping sounds amazing. Plus as a benefit of Prime, customers get free unlimited photo storage with Prime Photos. This is huge since I take so many pictures and I want them to be stored safely. That leaves me plenty of memory space on my phone. I am also thrilled with the low price, with prints starting at $0.09. That means I can send pictures to my mom who does not have internet access. Amazon Prints offers so much more than just prints. Amazon Prints also offers Photo Books, Photo Gifts, Photo Canvases, Wall décor, Cards, and Calendars. I am thinking gift ideas for the holidays. So go check out Amazon Prints for all your picture needs. With free unlimited storage for Prime members (5GB if not a member), free shipping (with Prime), and low prices this is a great deal! Thanks to Amazon for sponsoring this post and providing prizes for the giveaway! 1st prize of a $500 Amazon gift card, or one of five $100 Amazon gift card 2nd prizes. Amazon, Fire and the Amazon Fire TV logo are trademarks of Amazon.com, Inc. or its affiliates. WOW I am so impressed with this giveaway! I tell you what, I could not do without my Amazon Prime! I renew my membership every year! TOTALLY worth it! So many benefits! I would have photos that I plan to scrapbook printed. I recently ordered some prints through Amazon and they came back looking great and fast. I love having Amazon Prime! I love the fine quality and resolution of the prints, and would use it for invitations. I just got in an order of my Amazon prints and I'm super pleased with them. I've been an Amazon Prime member for years now and plan to continue to be one. I am an artist and would love to have some cards printed of my paintings! This is such a great service that Amazon provides. Every day I can't stop being amazed at how many options they have for their Prime membership, definitely a good deal! I've never tried this service before! I think it's awesome that Amazon offers this. It's definitely worth it! I like that they offer free standard delivery. I will print travel photos from our different trips. I like the Collage Print feature. I had no idea Amazon did prints as well! That's really good to know! I didn't even know Amazon offered this! I've just bought a new camera (from Amazon of course) and have a LOT of photos to print! I would love to have some photo books printed, in addition to some prints that I have saved from the past few years. I found this giveaway on Mom Knows Best blog. Great giveaway. I don't use the .com site since I am in Canada but now I am hopeful they will offer this on their Canadian site soon! I also love end of the year holiday photos to go.